Byron Buxton was not completely satisfied with his introduction to baseball’s highest level. That’s the simplistic way to phrase it. More accurate: Pitchers dissected him like a science project. He swung through a high percentage of over the plate. His strikeout rate ballooned as they threw him a bevy of breaking balls and fastballs off the plate. When he did connect, more often than not, the ball came off his bat at the speed of spilt syrup. This performance was unbecoming of the game’s top prospect. Hitting the ball -- and hitting the ball hard -- has been Buxton’s goal heading into his second tour of duty and he’s made changes to reach that goal. While Buxton acknowledged he was seeing pitches and movement that he had never truly experienced in the minor leagues, he was not making any excuses for the results either. After striking out in nearly 40 percent of his plate appearances over his first 21 games, he was able to reduce the frequency to 25 percent over the last 25 games. He quit chasing as many pitches out of the zone and he was able to put the barrel on a few more. Buxton said that he felt that he was able to anticipate a bit better what pitchers were trying to do with him in his last month of the season. Going forward, however, Buxton wants to be aggressive earlier in the at-bat and avoid the dreaded two-strike counts. In terms of his contact, the gory batted ball numbers paint a somber portrait of Buxton’s first season with the Twins. ESPN/TruMedia’s data said that Buxton posted a .054 well-hit average (compared to the MLB norm of .138) which was the fifth-lowest among all hitters with 90 or more plate appearances. Likewise, according to BaseballSavant.com, Buxton’s 2015 Exit Velocity average was 87.3 miles per hour. In a simple terms, a ball hit 87 miles per hour roughly translates to a .236 average with a paltry .282 slugging percentage last season. On the other hand, if he were able to increase the exit velocity to send more pitches back out at the 90-95 mile per hour range, he could be looking at a .290 average with a .400 slugging -- a slash line that would be very respectable for a 22-year-old center fielder. In order to generate more velocity off the bat, Buxton worked on incorporating a little leg kick into his swing. Buxton’s mechanics may remind some of Torii Hunter’s swing but Buxton quickly dispelled that notion by saying that Hunter did not influence his swing style -- only helped him with the mental side of the game. So far this spring he is satisfied with this changes in his swing. The hardest part, he says is gaining the right amount of at-bats to feel fully confident. 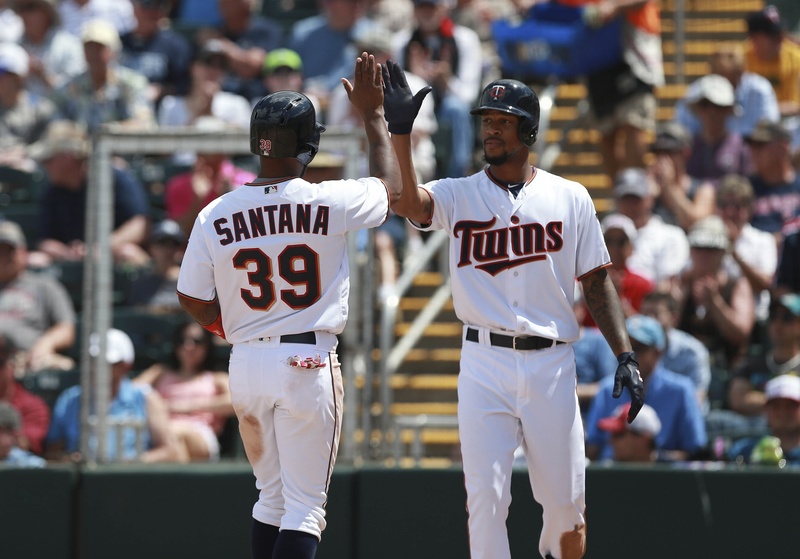 Byron Buxton is in the midst of the maturation process. In some capacity, all players go through this stage. Some do it quickly and some linger. Buxton has all the raw natural tools to be one of the game’s best two-way players. A rough introduction at the plate shouldn’t sidetrack that outcome. The toughest part is getting to that bat flip at the end. Takes confidence. I think for the first year or two he will be more valuable in the field than the plate. Hopefully he starts the year batting ninth and he can focus on playing great defense. Eh. His defense is strong, but he will never be an elite player if he doesn't learn how to hit major league pitching. He could have all the speed and defense in the world. If he can't hit then he isn't a very good major leaguer. I really think (hope) this philosphy harkens back to the Gardy days. They did that with Gomez, and got so frustrated Gardy had him shipped out. i'm hoping Molitor & Bruno realize this kid could be something special, and don't try to turn him into the next Otis Nixon. Talk about going out on a limb! If Buxton can't hit he isn't going to be a star! With Atlanta Nixon hit .278 with a .351 OBP. and while fast he wasn't Buxton fast. I would be just fine with .278 and .351 OBP from a lead off hitter with blazing speed and great defense. I hope Molitor and Bruno realize this kid isn't Mike Trout and end up turning him into the next Willie Norwood. I also don't think the mistake was shipping out Gomez for Hardy but rather Hardy for nothing. Not to mention it is quite likely that Gomez would have done just fine with Twins if he had been here several years also. Sounds silly, but I have talked with a number of people who believe his speed and defense already makes him a star. He also needs to learn how to steal bases, which he was mediocre/bad at last year in the majors. I hope he figures it out, loads of natural talent there. I would add "without hurting himself," to the first sentence. My second-biggest worry with Buxton is that he is going to be a great player for 120 games a year but always have a stint or two on the DL. I have all the confidence in the world that Buxton will be outstanding defensively and very good offensively, even if he never reaches great status. Too much raw ability, and even in milb he showed the ability to adapt and improve. Now, how quickly he starts being at least good is the question. Still so, so young and missing most of a season did him no favors. I am not saying it's a mistake to have him in the majors to begin the year. But I do think it's a mistake to feel compelled to. Without any real evidence that he will learn more in AAA than he will in ML, I think it is and should be a given he makes the roster. I firmly believe he becomes a superstar, but would not be surprised at all if his obp hovers around .300 this year, but his value in the field and on the bases is far greater than any other option can provide. Buxton only has 55 ABin AAA. He's going to struggle at the plate. I think they're rushing him to appease the fans. But with Sano lumbering around RF they need his range in CF. Jeff Sullivan did a chat at Fangraphs today. In the chat, this was brought up by our own Mike Sixel (forgive me if he's mentioned this already). "Ever going to hit .260" seems extremely bearish, even though he highlights speed and defense value. Won't let me edit right now. Buxton has 170 total at bats above AA at 21. I am not shocked about a struggle. If Buxton wants to crank up his average, he can do what players have always done: Swing flat with a smaller bat. Especially now in his first full year, Buxton's greatest value to the team offensively is for him to spend a lot of time on base, then use his speed to apply pressure. The home runs can come later, after he's familiar with major league pitching. Buxton had59 AB in AAA and hit over .400. Whatmore would Buxton have to learnat AAA?He came, he saw, he crushed. His batting average last year in the majors was the learning curve and adjustment phase. Now that he is all learned and adjusted, with his speed he can hit well over .300, Surely he will have a hit for every third at bat. Seems just based on speed alone he should hit over .260. The swinging bunt yesterday was a prime example of how he's going to get hits that others would have been thrown out on. the issue wasn't the trade of Gogo, it was the treatment and patience. I'm not sure Buck and Gogo are good comps though. Buck seems to have a better head for the game, but that's just conjecture based on a handful of articles I read on the internets. Personally I find it reassuring Buxton is trying to adopt a more aggressive approach at the plate. I agree the Otis Nixon batting avg/obp comp is a different era of baseball. .278/.351 in 2016 would be a great season to build upon. Buxton's swing last year reminded me of Molitor's with the no load, still head and quick bat and while I would be ok with Nixon's numbers this year I would be thrilled with Molitor's. The problem is that kind of swing still has a rhythm to it and Buxton struggled to recognize pitches and appeared to be indecisive resulting in late and weak swings. I am just hoping for a good start. I think veterans know the hits will come and don't freak out about an early low batting average but rookies press. I always thought Valencia's good year was spurred on by a few infield hits and bloopers in his first couple weeks. It allowed him to relax until he squared up a few. On a separate note I always wonder about broadcasting your approach in the papers. Opposition might be reading these papers as well. I don't think there is anything a team can glean from Buxton's discussion. Sure, he wants to be more aggressive early in the count. Until anything changes and he proves he can hit in those situations, they'll likely continue to pitch to him the same.